Last night we finished our Game Night 2019 season. Nine game nights, with one postponed due to a snowstorm (! ), brought us from January 18th to the first day of spring, through the darkest part of the year, with merriment and challenge to look forward to each Friday night. This year we added three nights with Crew Two. 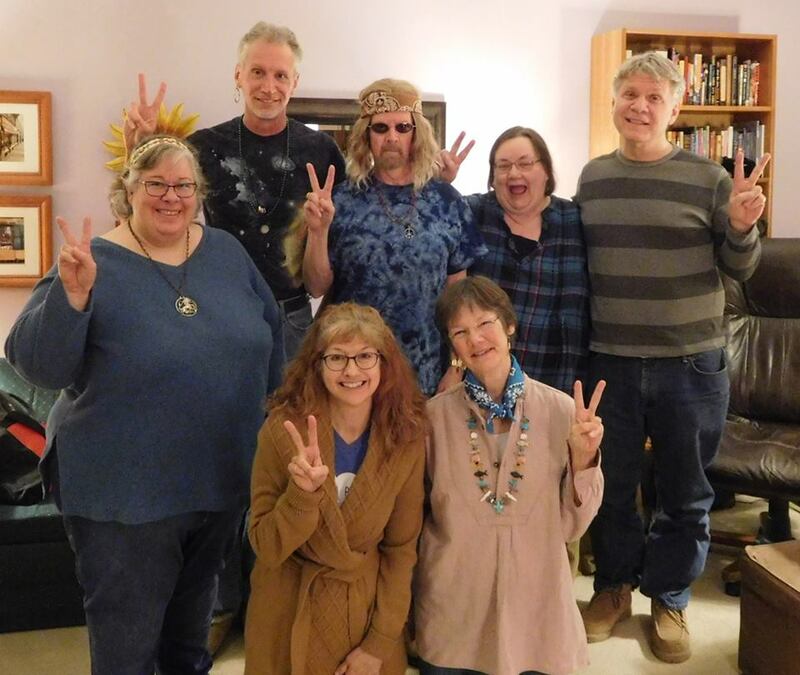 Last night, these were our game players for a night themed Harmony & Understanding, featuring the years 1968-1972 in the US. We identified icon scenes and events from the era. We played Name That Tune with songs like Chain of Fools, Mony, Mony, and Gypsies, Tramps and Thieves. There was a Celebrity Box Stacking game in which this Crew got every single clue right. We wrote captions for New Yorker cartoons and shared a Trippy Encounter Session. Big thanks to Crew Two and Crew One and the extraordinary Game Masters. Aren’t Crew Two’s hippie homage costumes fun? And a little later in the evening, Mike shared his musician alter ego. I am so grateful to everyone who takes part in Game Night, getting us through the winter! 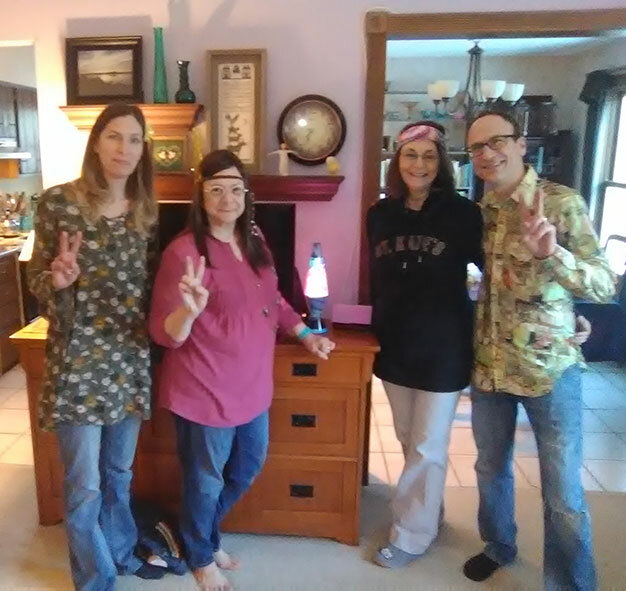 Please note in the photo: tunic, Qiana picture shirt (formerly worn by a real, live rock musician), bellbottoms, bare feet, headbands, flowers in her hair, peace signs, and there’s a lava lamp on the cabinet behind them. Far out! In 2014, we began hosting a game night for six Friday nights during January and February. Steve and I were having a tough time with winter and grief. We suspected that surrounding ourselves with friends and playing games would be a healthy—and fun—prescription. We were right! 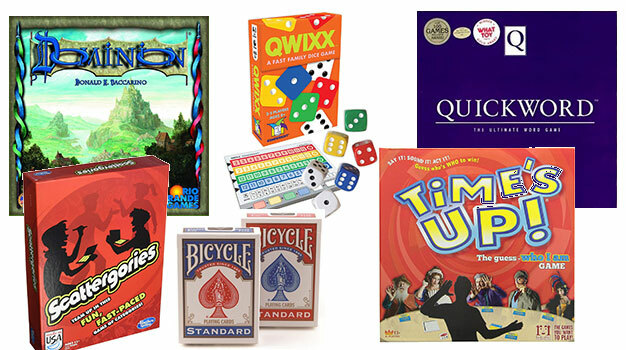 The games are designed to fit a theme, several people take a turn hosting an evening, and the laughter, talents, and wisdom are always heartwarming. I am grateful for those warm hearts, the avid game-playing, and the creative efforts of this very dear group of people because, really, it’s not about the games … it’s about the people. If you’re looking for a way to brighten your winter, give game nights a try! Growing up an only child, I was happiest when friends or family would gather to play games. Each Christmas I received a game I could play on my own, which I appreciated, but it wasn’t as satisfying as playing with others. I am grateful to friends and family who love to play cards, board games, and home-designed games. I cherish the warmth, challenge, and camaraderie of those times we’ve spent together. And I look forward to encountering new friends for whom games are a vital ingredient of life.